Polarizing filters belong in every outdoor photographer's camera bag, as they eliminate the glare and reflection from water, glass, and other reflective objects. Moreover, like IR control filters, they work to lower haze when photographing distant scenes such as hills and mountains. In general, polarizing filters will make your outdoor images more vibrant. How Does a Polarizing Filter Work? Polarized lens filters consist of two sheets of glass with a thin layer of polarizing material in between. The outer sheet rotates to alter the level of filtration. In higher-end lens filters, the polarizing film layer is bonded to the glass. This results in a tighter fit, and consequently, higher optical purity. One thing to remember is that the polarization process also reduces the amount of light passing into your camera. In fact, you can lose up to three stops by using a polarizing filter. To compensate for that, adjust your aperture or shutter speed. This is worth getting right, because the effect that a polarizer achieves is difficult to replicate via editing. 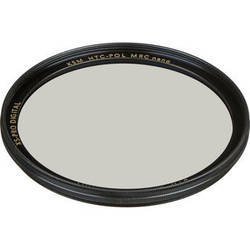 What Are Polarized Lens Filters Used For? As the name suggests, they work to remove polarized light such as the light reflecting off water; for example, puddles, lakes, oceans, polished surfaces, windows, and other sources. They also enhance color saturation, giving you bluer skies, clearer water, deeper shadows, more vibrant clouds, and more. Polarized lens filters also have indoor applications, like eliminating the ugly glare that could appear when shooting museum exhibits through glass, or photographing paintings with reflective varnish. Polarized camera filters come in two main types: circular and linear. Circular polarizing filters (CPF) screw onto your lenses. This makes them easy to attach, but you'll need a separate filter for each size of lens in your kit. Linear filters fit into holders, and you just need adapter rings of the right size to attach them to your lenses. This is far more economical than buying separate filters for each lens. Another factor to consider is the type of lenses you work with. If your camera is equipped with autofocus lenses, it's best to use CPFs, while the linear type is more suited for manual focus lenses. Prepare to take some great outdoor shots with the quality polarizing filters, IR control filters, and solid color effect filters available at B&H Photo and Video.